Drew Goddard and Joss Whedon’s 2012 film The Cabin In The Woods has been both revered and reviled by movie fans. For its supporters, the metatextual approach to examining tropes of the horror film genre was a unique way of discussing both the need for scary movies in audiences’ lives and the problems with a stagnant subculture that seems to churn out the same product on a regular basis. For its detractors, the film is a pretentious and ridiculous attempt to overexplain something while not providing any real scares of its own. But no matter what side of the divide you fall on, there is something most can agree on: The film is stuffed with references to well-known horror icons and film conventions that Goddard and Whedon use to further their meditation on the role and status of horror movies. On his channel, YouTuber GoodBadFlicks (real name Cecil Trachenburg) showcases lesser known genre fare and explores the various aspects of better known action/horror/sci-fi films. 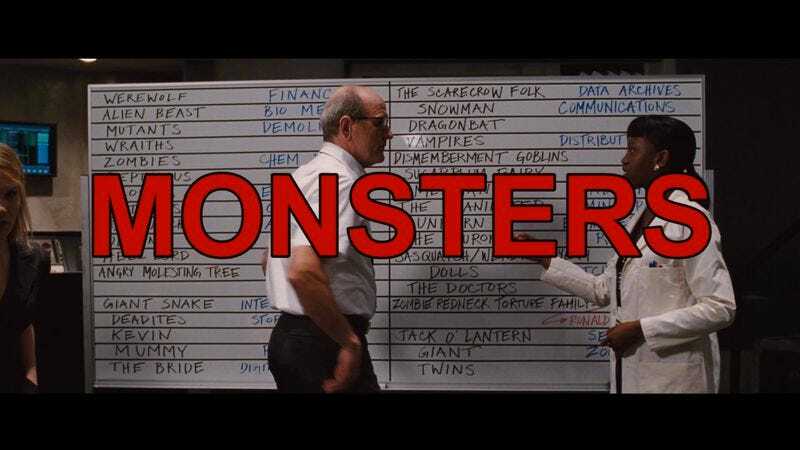 In his latest video, Trachenburg lists through all of the various references made in The Cabin In The Woods, from its multiple nods to Raimi’s Evil Dead films to the lesser-seen monsters contained in the cube prison. Some of the references are fairly obvious (the Hellraiser stand in, for example), but Trachenburg thoroughly dissects the elements that the writers and director used to pay tribute to (and take digs at) the genre they so clearly loved. There may be a few missing (the title at the beginning is a reference to Haneke’s Funny Games, for example) or some that are a stretch, but it’s still an impressive accounting of ways the filmmakers incorporated previous horror tropes. Trachenburg also goes on to discuss the overarching themes of the film, including the audience’s culpability in demanding the same stories and products every year.